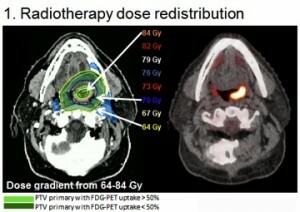 Increasing the therapeutic ratio for head and neck cancers by pre-treatment selection and dose redistribution. 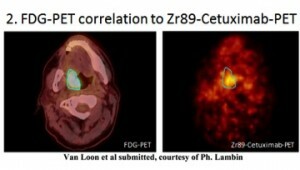 Within the proposed head and neck cancer trial sophisticated tools are introduced to improve treatment outcome of patients with advanced tumours by enabing tailored radiation to the most active parts of the tumour. This trial aims to evaluate the impact of dose redistribution within the tumour on loco-regional control and toxicity. The protocol exists of two treatment arms, randomizing between standard dose (70Gy in 35 fx) and dose redistribution (64-84 Gy in 35 fx) based on FDG-PET uptake, with adaptive RT. * The NKI (Amsterdam) has the lead for this study. Furthermore, this trial will provide the materials to develop treatment specific tumour response predictors for patient selection. The aims of patient selection are to increase treatment outcome with tailored treatment, to improve quality of life by withholding ineffective toxic treatments and to decrease community costs by targeting expensive treatments to those who will benefit. Biopsy material will be provided to WP5 to develop genetic predictors for cisplatin and radiation sensitivity. Pretreatment functional (Zirconium and HX4 PET-scans) and anatomical imaging (CT) will be provided to WP6 to allow standardization of imaging in a multicenter setting and the development of decision models. Functional imaging during treatment (FDG-PET scans) will be provided to WP3 to design algorithms for biological adaptive treatment planning. Moreover, anatomical imaging (Cone beam CTs) during treatment will be provided to WP2 for the development of adaptive radiotherapy techniques. 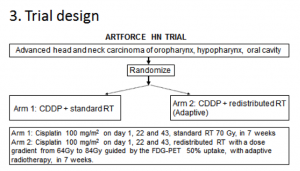 *In May 2014, the protocol was amended from a 2×2 design (cisplatin versus Cetuximab and standard RT dose versus RT dose redistribution) to the current 2 arm trial design.